1. Which describes a common difference between terrestrial and aquatic ecosystems? A. Organisms in terrestrial ecosystems are dependent on oxygen, while those in aquatic ecosystems are not. B. Nutrients are a limiting factor for populations in aquatic ecosystems but not for terrestrial populations. C. Producers make up the greatest amount of biomass in terrestrial ecosystems, while in aquatic ecosystems they do not. D. Sunlight is a limiting factor for populations in terrestrial ecosystems but not for populations in aquatic ecosystems. E. Energy in aquatic ecosystem is transferred from lower to higher trophic levels, but it moves in the opposite direction in aquatic ecosystems. 2. Which of the following are documented effects of increasing average global temperature on fish populations? 3. Which of the following remove nitrogen from the atmosphere? 4. At which time point in the graph below does the size of the population reach the carrying capacity for the ecosystem? 5. An invasive species is likely to encounter fewer of which of the following in its new ecosystem? 6. Semelparous species produce a large number of offspring once in their life spans. Iteroparous species produce a small number of offspring repeatedly throughout their lives. Which ecological condition will most likely select for a semelparous strategy? 7. The first terrestrial forests depended on the evolution of which plant structure? 9. Which of the following is a biotic factor that limits the growth of a population in aquatic ecosystems? 10. How does the concept of inclusive fitness explain altruistic behavior in animals? A. Altruism is the result of learning and occurs in most social species. B. Altruism results in the production of a greater number of offspring. C. Altruism lowers stress in altruistic individuals, which increases fitness. D. Altruism results in other individuals performing altruistic acts in return. E. Altruism increases the number of young of genetically similar individuals. 11. The diagrams show three dispersion patterns. 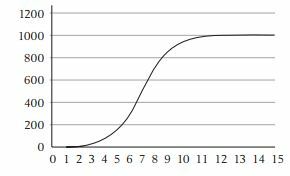 Which species characteristic results in pattern 2? 12. 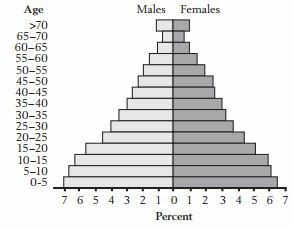 Which type of population growth is represented by the graph below? 13. Which of the following is positively associated with biodiversity? 14. Some rocks feature red bands or streaks made up of iron oxides, formed when iron reacts with oxygen. These originated from dissolved iron in the oceans, which formed oxides and settled to the ocean bottom. What allowed this chemical and physical process to occur? 15. Which statement BEST describes the Allee effect? A. Population growth increases as population density increases, below a certain density. B. Population growth increases as population density increases, above a certain density. C. Population growth decreases as population density increases, above a certain density. D. Population growth increases as population density increases, causing density to then decrease. E. Population growth decreases as population density increases, causing density to then decrease. 16. 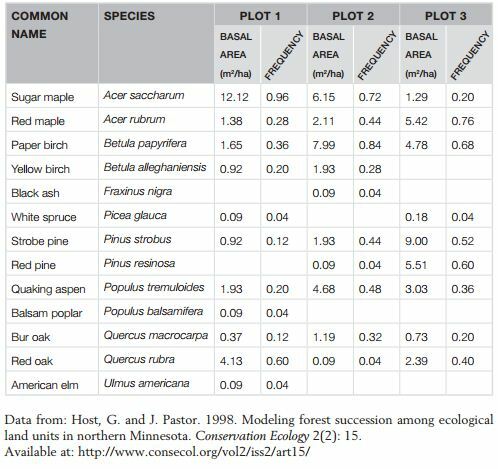 Ecologists surveyed the composition of three different forest plots. They measured the frequency of occurrence of 13 different tree species and the basal area of each species. The basal area is calculated by measuring tree circumference at breast height and calculating the area occupied by a particular species in square meters per hectare. Which is the most common tree species in Plot 3? 17. Ecologists surveyed the composition of three different forest plots. They measured the frequency of occurrence of 13 different tree species and the basal area of each species. The basal area is calculated by measuring tree circumference at breast height and calculating the area occupied by a particular species in square meters per hectare. Which two species are most closely related? 18. Ecologists surveyed the composition of three different forest plots. They measured the frequency of occurrence of 13 different tree species and the basal area of each species. The basal area is calculated by measuring tree circumference at breast height and calculating the area occupied by a particular species in square meters per hectare. The data shows a negative, or inverse, correlation between which two tree species? 19. The graph on the left shows the average monthly temperature and precipitation in Taiyuan, China. Taiyuan's average annual temperature is 10.3°C, and its average annual precipitation is 381 mm, or 38.1 cm. 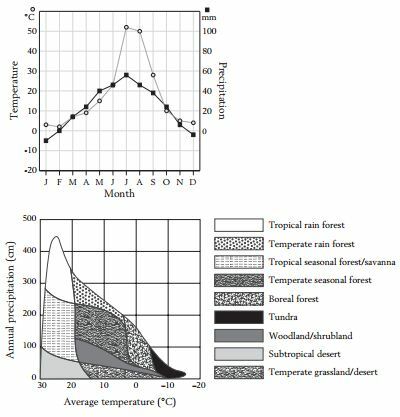 The graph on the right depicts the classification of biomes according to precipitation and temperature. In which month does Taiyuan, China, experience the LEAST precipitation? 20. The graph on the left shows the average monthly temperature and precipitation in Taiyuan, China. Taiyuan's average annual temperature is 10.3°C, and its average annual precipitation is 381 mm, or 38.1 cm. The graph on the right depicts the classification of biomes according to precipitation and temperature. According to the graphs, in which type of biome is Taiyuan, China, located?